Thirty-four-year-old Dely Roy Nalo is a Ni-Vanuatu visual artist and cultural field worker who is passionate about promoting and safeguarding the cultural heritage of Northern Vanuatu. Dely lives in Luganville on Espiritu Santo Island with her family and speaks fluent French, English and Bislama, in addition to her father’s vernacular language, Mwerlap. “My idea is that if each culture can understand or at the very least acknowledge each other, a platform can be set for mutual respect” she told the SPC. Her major achievement and ongoing contribution to the arts and cultural field in Vanuatu is through TEKS Unit, a grassroots indigenous movements which Rely founded and established in 2011. TEKS stands for Traditional Entertainment & Kastom Support – the Unit uses alternative locally-based approaches to cultural resource management through the promotion and preservation of important traditional wisdom practices including dances, music, songs, and stories, and connecting these with contemporary music and dance; and traditional artistic creations such as carving, weaving, painting, drawing and fabric art. TEKS Unit, through its key partners: Further Arts, The Christensen Fund, UNESCO, Ethos Global and Volunteer Services Abroad, has been able to support local artists and performers and their communities through mini arts festivals, exchange programs and camps, and product development and promotion. TEKS’ youth media unit also works with communities to document their activities through co-produced audiovisual content in local languages. 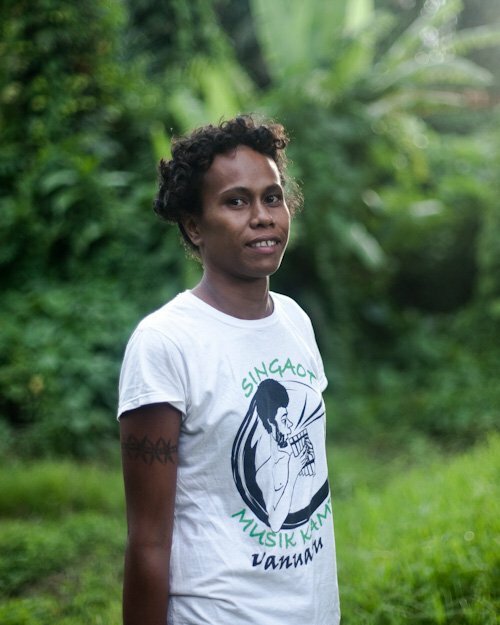 Through her work and commitment to promoting positive kastom values, Dely has facilitated opportunities for ni-Vanuatu traditional performers at: the Festival of the Pacific Arts in Solomon Islands in 2012, Balance-Unbalance Conference and performance tours in Australia in 2013, and, WOMEX – the International World Music Expo. She has also represented women’s water music groups and traditional kastom performers at forums including the Festival of Pacific Arts 2016, World Conservation Congress 2015 and UNESCO 9th Youth Forum 2014. Additionally, Dely is dedicated to working with young children to instill positive kastom values and cultural heritage education early through the Creative Arts Pikinini program which provides a creative space and support for children to explore their diverse cultures through visual art. This program has been endorsed by the SANMA Provincial Government. Dely’s work through TEKS has also been recognised by the Vanuatu Cultural Centre. This portrait of Dely Roy Nalo was first published by the Pacific Community for the 70 Inspiring Women campaign, it is reproduced here (with some modifications of our own) with their permission.